This Crochet Flower Square Blanket Is So Beautiful! Fast and easy, this adorable set is a perfect gift for any baby. Of course, no flower for the baby boys! As surprising as it may seem, this blanket is in fact just a traditional granny square with an edging. The ribbon really adds to this cute and easy blanket and the border is just stunning. So different and elegant! 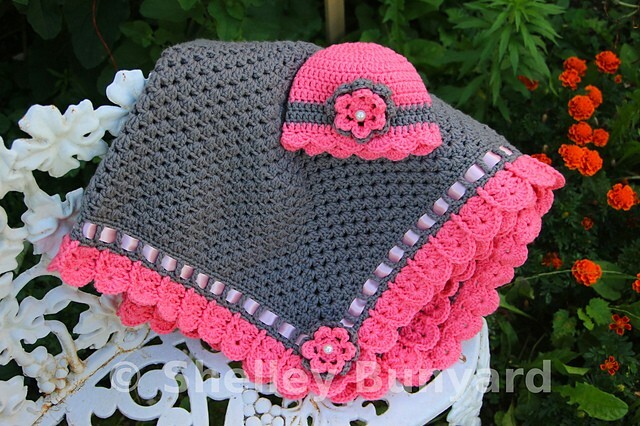 This Granny Square and Ribbon Baby Blanket Set by Shelley Bunyard is an amazing baby shower gift, any soon to be mom will appreciate! Depending on the size of your granny square will change the count for the edging and really that is all this blanket is… a traditional granny square with a fancy edging. The hat is a bit more exact. The hat fits a 0-3 month baby. Thanks to Shelley Bunyard for the article inspiration and featured image. Carol Boeck Mayfield Do you crochet? If you’re looking for someone to make this for you, check Etsy.com. Good luck!! I’ve made this twice. It was fun and turned out great. Kay Lynn, this has Cora written all over it. Made this for my first granddaughter last year. Her mother liked it & my lil Punkin has enjoyed it too. I love this pattern…its easy and fast off the hook. Gonna do this one for sure! Debra Barlow Hardy! OMG. I love this so much. Maybe I can do one too. Love this one! I’ll save it to my page. Beautiful! I absolutely love this, the colors are gorgeous together!! It’s just not the typical baby blanket. Thanks for sharing!! What color would be nice for a boy’s version of blanket? ANY blue or green jewel tones would look beautiful for a boys’ version of this set! I made this one. Did a couple simple changes, but love it! That’s what I think, too! Here you go Carol Seaba ! I love this and the colors. That’s so beautiful! Love the gray with the pink! I love this pattern. I made the hat for Peri a couple of years ago. Linda Stefanski and Heather Stefanski Beitz I thought of you two when I saw this. At first I thought it was a poncho, which would be very cute too for your bigger girls. I LOVE this color combination. I made this one also. Margie Boroz ! I gonna star working on you gbb present! ! Love the design on this one. How do I find the free pattern to this afghan? That is adorable. That is absolutely beautiful!! Can you please put up video tutorials on this set…even after all these years of crocheting, I can’t follow written directions…lol. Julie Schuler we will talk. Laura Nance, these colors look good together. I have never liked the color grey untill I saw this – it is beautiful!!! I made this one in yellow and pink. Ashley Fair I love these colors! I love pink and gray together! How much to make a set for me to give as s present Tonya Mulford. This is so adorable! So love these colors together. Beautiful. Laura Lee, this is the one I was talking about. Bethany Mutter Tara Hemmerly. Can someone please have a girl. I love these colors and I want to make something other than blue. May have to try this one for a baby shower later this month. Made this blanket. Came out so nice. I can’t see the instructions. I really the picture. Sue please click where it says: This Granny Square and Ribbon Baby Blanket Set by Shelley Bunyard or below the picture: Check out the original source for this pattern with all the directions and full written pattern at….folowed by the link. Hope it helps! this is so pretty and what a coincidence I am making it right now for a neice in different shades though . I am just about to put the border on . Made this in two shades of purple. Love the pattern. K C Lynne Bunch here’s one for you!! What a pretty boarder.. love the gray and pink colors.. nice job!